The Minnesota Astronomical Society (MAS) has sponsored Messier Marathons for many years. Recently they've begun holding the marathon twice a year by adding a fall gathering for what's called the mini-marathon. The spring marathon gives everyone a long, good look at the Virgo cluster of galaxies, home to 16 Messier Objects. There are more than just Messier galaxies in the cluster and deciding which particular faint fuzzy you see in your eyepiece can be difficult. Navigating the Virgo cluster is difficult for anyone who hasn't done it frequently. Beginners wander into the cluster not just during marathons but also when working on their Messier lists. It's not unusual for them to leave the cluster with a sense of frustration. With that frustration in mind the MAS started what it calls the Virgo Venture, a spring evening during which all attention is on the cluster and learning how to navigate it. Special star-hopping charts are provided and there's an experienced navigator around to help observers find their way. 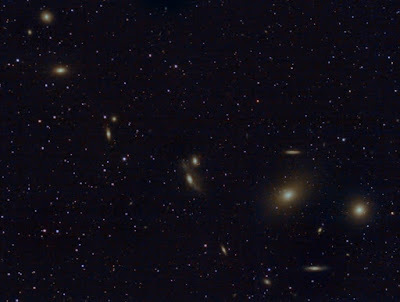 It was at one of these Ventures that I first observed Markarian's Chain, a gentle arc of galaxies in a small patch of sky. It was the first time that I'd seen more than two galaxies in the same field of view. In fact, I could count six, and with a little travel add a few more! I was impressed, and it marked a first appreciation of wide field viewing for me. This year's Venture was held last Saturday despite thinning cirrus clouds running east-west over the site and a thick plume of smoke from Canadian wildfires. My imaging target was the Chain but given the overhead murk I didn't have a lot of hope. I shot an hour of light frames with the haze and another hour as the haze was disappearing, so it didn't turn out too badly. 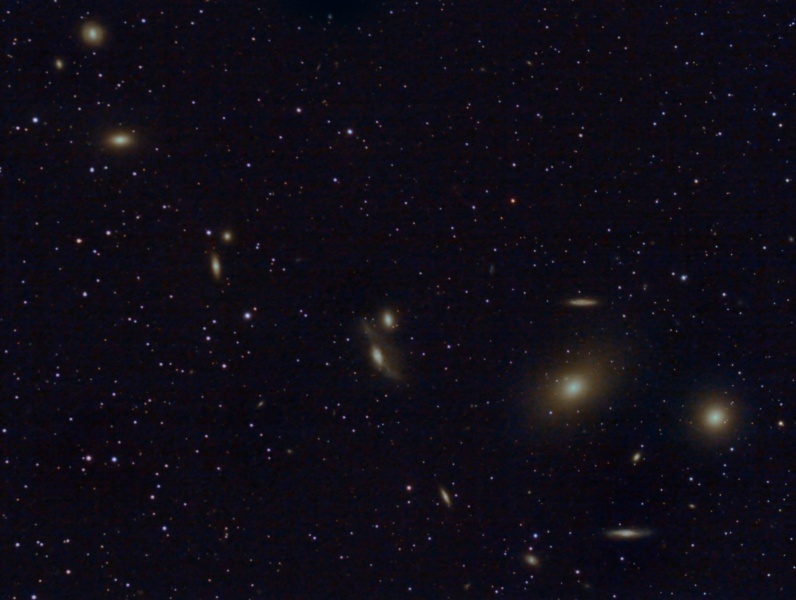 Markarian's Chain, stretching from the two fuzzies in the upper left corner to M84 near the right edge. The acquisition details are at AstroBin. Briefly this is two hours of light frames using a modified Canon T2i at ISO 800, a TV-102 at f/7, and autoguiding. The weather forecast suggests a week of clouds and then the moon comes back. A good cycle to do some lunar/planetary imaging, I suppose. June's new moon will bring a last shot at many Arp galaxies, and then it's summer and back to nebulae!